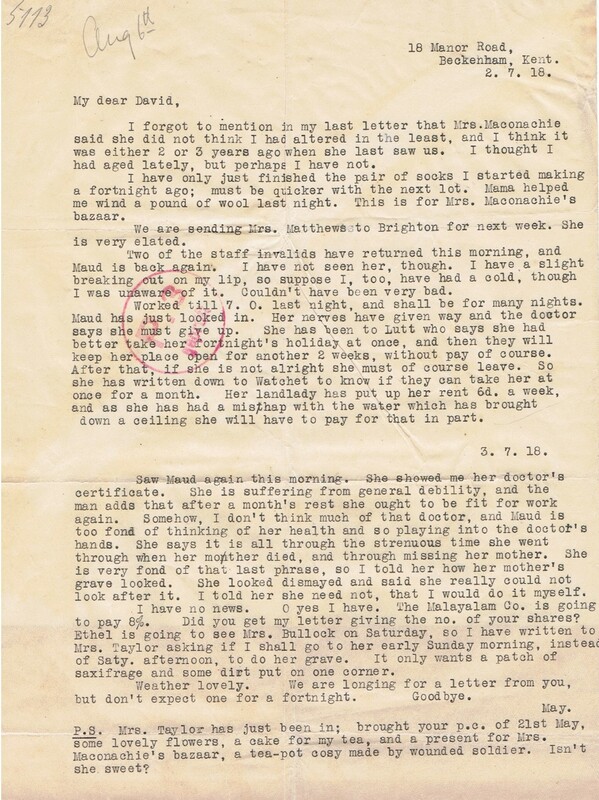 I forgot to mention in my last letter that Mrs Maconachie said she did not think I had altered in the least, and I think it was either 2 or 3 years ago when she last saw us. I thought I had aged lately, but perhaps I have not. I have only just finished the pair of socks I started making a fortnight ago; must be quicker with the next lot. Mama helped me wind a pound of wool last night. This is for Mrs Maconachie’s bazaar. We are sending Mrs Matthews to Brighton for next week. She is very elated. Two of the staff invalids have returned this morning, and Maud is back again. I have not seen her, though. I have a slight breaking out on my lip, so suppose I, too, have had a cold, though I was unaware of it. Couldn’t have been very bad. Worked until 7.0 last night, and shall be for many nights. Maud has just looked in. Her nerves have given way and the doctor says she must give up. She has been to Lutt who says she had better take her fortnight’s holiday at once, and then they will keep her place open for another 2 weeks, without pay of course. After that, if she is not alright she must of course leave. So she has written down to Watchet to know if they can take her at once for a month. Her landlady has put up her rent 6d a week, and she has had a mishap with the water which has brought down a ceiling she will have to pay for that in part. Saw Maud again this morning. She showed me her doctor’s certificate. She is suffering from general debility, and the man adds that after a month’s rest she ought to be fit for work again. Somehow, I don’t think much of that doctor, and Maud is too fond of thinking of her health and so playing into the doctor’s hands. She says it is all through the strenuous time she went through when her mother died, and through missing her mother. She is very fond of that last phrase, so I told her how her mother’s grave looked. She looked dismayed and said she really could not look after it. I told her she need not, that I would do it myself. I have no news. O yes I have. The Malayalam Co is going to pay 8%. Did you get my letter giving the no. of your shares? Ethel is going to see Mrs Bullock on Saturday, so I have written to Mrs Taylor asking if I shall go to her early Sunday morning, instead of Saty afternoon, to do her grave. It only wants a patch of saxifrage and some dirt put on one corner. Weather lovely. We are longing for a letter from you, but don’t expect one for a fortnight. Goodbye. PS Mrs Taylor has just been in; brought your p.c. of 21st May, some lovely flowers, a cake for my tea, and a present for Mrs Maconachie’s bazaar, a tea-pot cosy made by wounded soldier. Isn’t she sweet?